"Meet the Press" posted its lowest ratings since David Gregory became moderator this past week, with the show airing Sunday, Feb. 1 averaging just 3.9 million viewers. The show, which featured Senators John Kerry and Kay Bailey Hutchison, as well as a roundtable including Erin Burnett and Steve Forbes, was Gregory's first as moderator to average less than 4 million viewers (he came close on the Sunday between Christmas and New Year's, but he still crossed the 4 million threshold). NBC notes that its Super Bowl Sunday coverage — which started with Matt Lauer's interview of President Obama and carried through to what the network described as the most-watched television event of all time — bumped "Meet the Press" to irregular start times in most markets and and meant that the public affairs program only aired in 96% of the homes it normally does. Because "Meet the Press" has become "appointment television," this may have contributed to the lower ratings for the week, as would many Super Bowl fans turning to pre-game coverage on, say, ESPN, between "Today" and the game. And were the program shown in 100% of its households, it would likely have crossed the 4 million viewer threshold. Still, the gap between "Meet the Press" and its competitors — CBS' "Face The Nation" and ABC's "This Week" — is closing, as the below graph shows. This week it was down to just under 600,000 viewers. "Face The Nation" averaged 3.33 million total viewers, while "This Week" came in just behind with 3.32 million total viewers. "This Week" even beat "Meet the Press" on January 11, when George Stephanopoulos interviewed President-Elect Barack Obama (though the margin of victory, 40,000 viewers, was disappointing given the enormity of the interview). While general interest has waned as the fever over President Obama's inauguration has calmed, "Face the Nation" did grow each week between January 11 and January 25, though it did not match its January 4 high of 3.6 million total viewers. 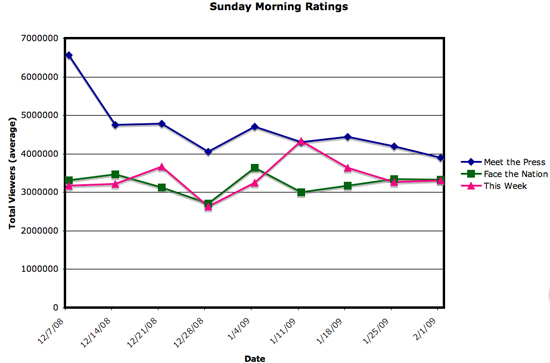 See the graph below, depicting Sunday morning ratings since David Gregory was named moderator of "Meet the Press."